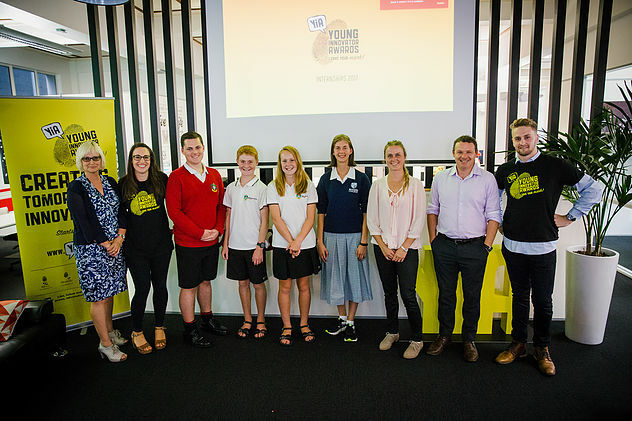 The Tauranga business and education community has had an opportunity to see the fruits of its support for the Young Innovator Awards (YiA) internships, which took place last month. The internships were an opportunity for last year's YIA winners to have a follow-on opportunity to develop their ideas with leading local innovators. The eight local students presented the results of their work late last week to a group which included WBOP Mayor Garry Webber and Priority One chief executive Nigel Tutt. Locus Research and Woods Creative provided senior winner Lydia Gilmour with a two-week internship to develop her idea, Swiftwrap, a mini-cling wrap dispenser offering fast first aid relief to burns victims. Bluelab, Beca and Woods Creative provided junior award winners Sam and Holly Sheaff with a two-week internship for their idea, GelShel, an aerodynamic pouch to reduce waste from empty gel packets at cycling events. ‍Cucumber provided an opportunity to spend two days with their team for the junior second- and third-place winning teams. Louis Donovan, Jonathan Tomlinson, Phoenix Morris and Jacob Tinning worked on Toast, an app that helps children learn to code. Meanwhile, Sasha Van-Beek worked on Pet Partners, an app that helps connect pet owners with people who want to care for a pet temporarily. The Young Innovator Awards is a joint initiative between Priority One Instep, Woods Creative and Blue Lab. This year's awards kick off on March 20.